On Thursday in Williamstown, Kentucky, I found myself standing in front of a biblically-accurate replica of Noah’s Ark. 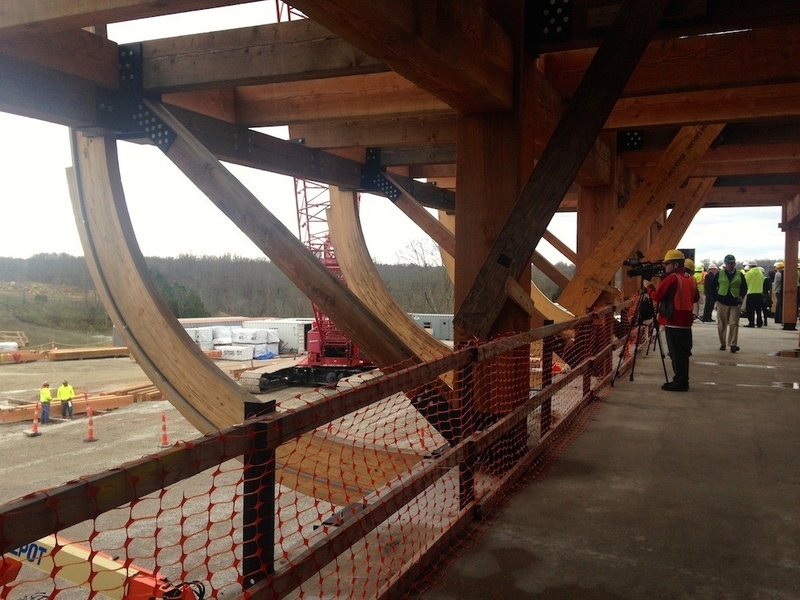 The 510-foot-long, 85-foot-wide wooden ship that can hold up to 10,000 people is just one attraction in the budding Ark Encounter theme park, which is slated to open to the public in July, 2016. The new park is a project of Answers in Genesis, a non-profit fundamentalist Christian organization that supports young-Earth creationism and opposes evolution. Ken Ham, the president and CEO of Answers in Genesis who famously debated Bill Nye on TV last year over evolution, claims the park will hold 16,000 guests a day and attract more than 1.4 million people annually. The park will also include a replica of the Tower of Babel, a first-century Middle Eastern village, a journey into history from Abraham to the parting of the Red Sea, and other Christian attractions. Ham told me in an interview he believes the park will be, “one of the greatest Christian attractions in the world.” But despite his optimism, the team is a few million dollars short of their $91 million goal, with funding coming from donations, bond offerings, and people purchasing “lifetime passes” to the park. During a press conference Ham held on Thursday at the park, he didn’t mention Ark Encounter was revoked $18 million in tax incentives, likely due to his plans to only hire religious employees and not gay or non-Christian individuals. Answers in Genesis also has a lawsuit against the state of Kentucky, claiming it’s been unfairly discriminated against under the Religious Freedom Restoration Act. Dr. Nathaniel Jeanson, a PhD in Biology who studied at Harvard and is also a young-Earth creationist, works alongside Ham at Answers in Genesis. 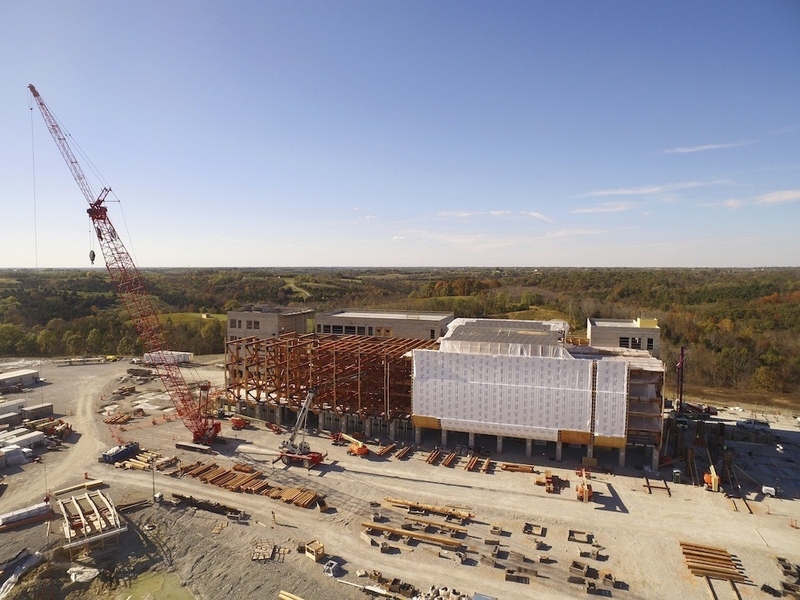 It’s his job to flesh out the educational aspects of Ark Encounter, including information about the story of Noah’s Ark and how he believes it affected the development of man and beast. I talked with Dr. Jeanson to discuss this project of biblical proportions. The Ark in construction. Photo: Belinda Cai. 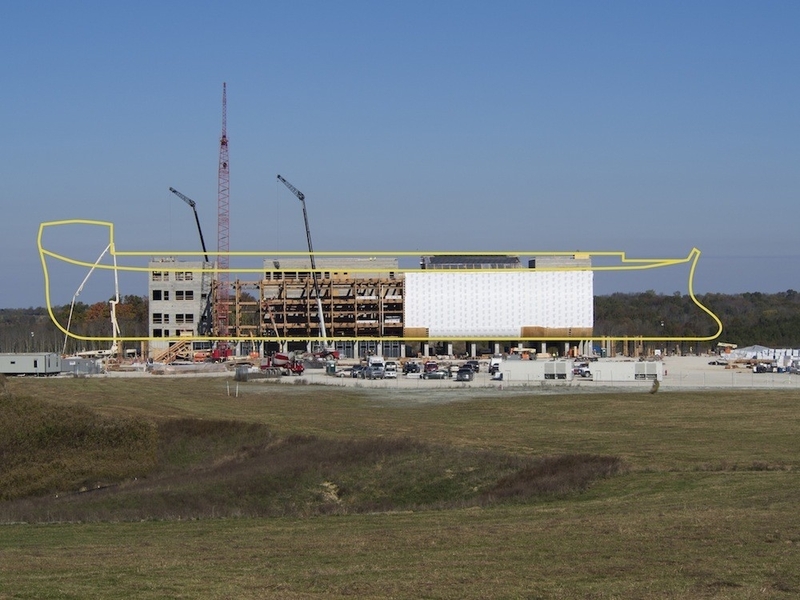 VICE: What is the main goal of opening Ark Encounter? On top of the size aspect, a lot of the displays will answer questions people may have about the animals that were onboard the ark, as well as offer contemporary evidence we see that’s consistent with what the scripture says about when the flood took place, how big the ark was, what happened, what implications it has for the origin of species, when they originated, how they originated, what implications this has for geology, and so forth. Can you explain exactly what happened on Noah’s Ark and how that led to the evolution of the species we see today? On the biological side, some of the questions we have been trying to answer is what exactly did Noah bring onboard the ark? In our framework from our young-Earth perspective, we’d say: God didn’t create species, per se. He created “kinds” that seem to be as a general approximation around the level of family. As a practical example, there [are] 35-36 cat species today, from lions to tigers to house cats. We’d say those all came from two individuals onboard the ark. Same thing with the dog family; wolves to coyotes to foxes to Chihuahuas from two individuals onboard the ark. [This applies to] virtually all the land-dwelling vertebrate species. Anything that is small and aquatic survived outside of the ark. Can you elaborate about the science used to support the educational aspects of Ark Encounter? Part of my research is to say, Can we precisely identify what those creatures [on the ark] were? One of the key sources that we’re using is genetics, but the tools to evaluate genetics are only recent. The human genome wasn’t sequenced until 2001 so nearly 150 years after Darwin. We know the rate at which DNA changes for a few species, such as humans. One of the subsets of the human sequence is the mitochondrial DNA, about 16,000 DNA letters long. We know the rate at which it changes: one every six generations. So you dial a clock back between non-African humans and there are 30-40 differences on average. Among Africans, there are about 78. You can explain that within 6,000 years. You can say 78 differences today, one difference every six generations. Dial the clock back 6,000 years, you get back to two people basically. These are the sorts of things we can do with other species if it’s been 4,000-5,000 years since the flood. [If you can] dial the clock backwards so to speak 4,000 years, that will give you a good sense of what those animals onboard the ark were. And then we can also do the reverse and say, OK, if there were two cats, how do you produce all of these different species in just a couple thousand years? Some of things I have been working on are [questions like] where did the genetics come from in the first place? The vast majority of our DNA is the nuclear DNA—the 3 billion letters. It comes in two copies, one from each parent. Same for the other species brought onboard the ark. From our perspective, it looks like God created diversity from the beginning. There is a huge construction crew here working on this for hours a day. How did Noah and his family manage this astronomical project? I think there are a couple of different answers to that. One is, his goal was slightly different and his timescale was slightly different in the sense that here we’re trying to build the structure within a couple of years. Noah had, like, 120 years. Plus, he could have hired help. Even though it was only he, his wife, his sons, and their wives that survived the flood, there were probably millions of people who were alive on Earth at that time who he could’ve hired to easily help him out. So in terms of manpower, that was available. There was an enormous amount of time that was available—he put something like this together in 120 years for the purpose of surviving for a year with his family and the animals. Then they could chuck the ark, essentially. So Noah lived longer than 120 years? He lived for I think nearly a thousand years. He was 500-600 years old when the flood happened. How could those people have lived for hundreds of years? From our perspective, God creates things perfect from the beginning and things have been degenerating ever since then. Even to this day, we can measure 60 DNA mutations per generation. Things are getting worse. There was probably more pristine genetic information, fewer mutations, and fewer diseases back then. They could’ve lived longer and been stronger longer. Noah would’ve lived much longer than 120 years and the people around him would’ve lived much longer. They would’ve had plenty of time and manpower to put this all together. How do you explain this to someone who can’t wrap his or her head around this concept? We’d have to say what are the reasons for our shorter lifespan today. You think maybe a couple of centuries ago people didn’t have as long of a life expectancy. Technology has improved our lifespan but, by and large, what causes death today even in Western, first world countries is aging and cancer. Things degenerate—break down. I think a lot of that is due to genetics. We have a corrupt gene pool. A lot of that is masked because we are heterozygous [and] diploid. You’ve got Adam and Eve, created perfect. They reproduce. Population size grows up until the time of the flood. Then there is a gigantic bottleneck with Noah, his wife, his sons, and their wives. That suddenly reduces the available gene pool. Suddenly, that reduces the amount of good genetic information that is available. You see what essentially amounts to a genetic decay curve. What happened to the remains of the ark? Why is there no tangible evidence? That’s a good question. People have been looking for a long time. It’s been 4,000 years. How many wood structures survive that long? Noah steps off the ark. There’s nothing on the planet, just him and his family. What do you look for first? I’d look for shelter, a place to live. You want to build it out of wood? Suddenly you’ve got a whole lot of wood around you that you can start breaking down for fire and sacrifice. He might very well have broken it down by himself and used it to build houses and structures. He’s got practical concerns to deal with, as do his descendants. In the young-Earth view, we say shortly after the flood, it creates the ideal conditions for an Ice Age, so there’s dramatic climactic changes. You put all of those things together and what’s the chance of [the ark] surviving after 4,000 years? Has there been any backlash to this project and your beliefs, and how has Answers in Genesis responded? I can speak on only having been here a few months. In general, the creation movement has plenty of critics. I’ve run into them myself. I welcome criticism. Science is based on peer review. It’s a process of elimination. If I’ve made an error, I want to know it. I’ll be speaking opposite an evolutionist in under a week and my request has been please peer-review my literature. Please evaluate what we’re doing so if there are scientific errors, we can correct them. That being said, in my interaction with evolutionists, my impression has been they are not aware of my position and the scientific details of what I’ve said. What I’d love to see is more interactions where they’re hearing out what I’m saying. I do my best to read all their literature. I queue up major journals… If there would be more knowledge of both sides, I think it would lead to more productive interactions between the two. But obviously, this is an extremely emotionally-charged issue.